One of the most beautiful and prosperous states in India is Karnataka. Bangalore is the capital of Karnataka. The state is immersed with indepth culture, history, tradition and cuisine. The state has tourist place for all age group and for all kinds of requirement. Beautiful waterfalls, bird sanctuaries, historical monuments, temples, palaces, and of course varieties in eateries makes Karnataka a must visit place in India. Karnataka is located in south western part of India. 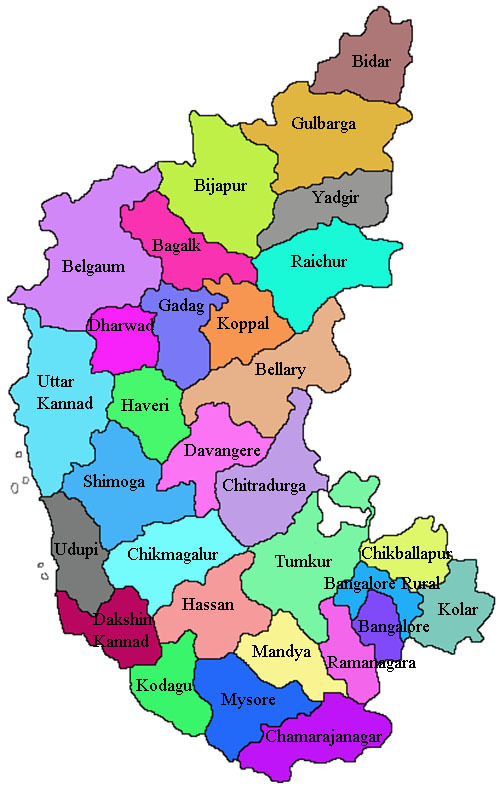 Karnataka state was formed on 1st November 1956 under state reorganisation act. The state celebrates 1st November as Kannada Rajyostava and it is a state holiday. The official language of the state is Kannada; however other languages like tulu, Konkani and Kodava are also spoken in the state. Karnataka is home for many tribal groups like Sholigas, Todas and Siddis. Karnataka is the eighth largest state in India in terms of population and third most visited state from tourism point of view. It is surrounded by Arabian Sea to the West, Kerala to the South, Maharashtra to the North, Goa to the Northwest, Tamil Nadu to the Southeast and Andhra Pradesh to the East. The main rivers of Karnataka are Krishna and its tributaries and Kaveri and its tributaries. Talakaveri where Kaveri River originates is an important tourist destination. Talakaveri is in the foothills of Western Ghats. A large number of dams and reservoirs are constructed across this river which helps in irrigation, power generation and as a drinking water source. The state has three main geographical zones that are the coastal region of Karavali, the hilly Malenadu region which comprises of Western Ghats and Bayaluseema region which comprises of Deccan Plateau. Karnataka has a very interesting and astonishing history with many dynasties ruling the state. Some of the dynasties that ruled over Karnataka are Wadiyar dynasty, Rashtrakutas, Chalukya, Vijayanagara Empire, Cholas, Bahamani sultanate, Yadavas of Devagiri, Kalachuris of Kalyani and Bijapur sultanate. Because of these dynasties Karnataka is blessed with mesmerising monuments, temples, tombs and palaces. The history of Karnataka dates back to Paleolithic age. Some of the instruments used by the people during paleolithic period like hand axe, clevers, pebbles have been found in places like Lingadahalli in Chikkamagalur district and Hunasagi in Yadgir district. Before the states were reorganised based on linguistic division in 1950, major part of present day Karnataka was governed by British under the name of ‘Mysore state’. Karnataka is a land of varied culture and festivals. People with great enthusiasm and energy celebrate all the festivals. The state is famous for theatre and folk dance forms like dollu kunitha, Yakshagana, Veeraghase and Kamashale. Dance is given a great importance in the state. Bharatanatyam is an important dance form in Karnataka. 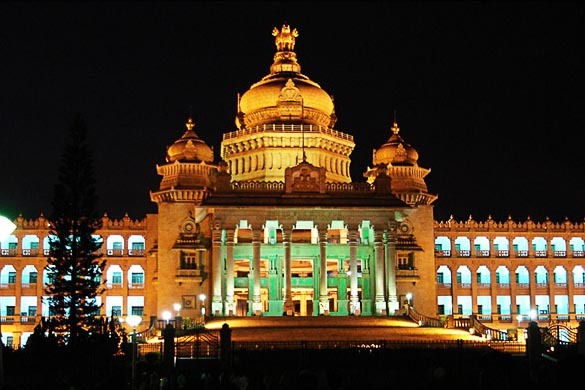 Karnataka is the only place where both Hindustani music and Carnatic music singers flourished. Hindustani music is more popular in North Karnataka and Carnatic music is more popular in South Karnataka. Some of the most prominent singers/ composers from Karnataka are Purandara Dasa, Kanaka Dasa, Vijaya Dasa, Gangubai hangal, Bhimsen Joshi, Mallikarjuna Mansur and many more. Gamaka is another important classical music based on Carnatic music which is sung in different parts of Karnataka. Mysore style of paintings is unique and magnificent. It mainly represents about the mythical scenes, history of the state and also paintings of the royal family. Some of the well known painters in style are Sundaryya, Tanjavur kondayya, B Venkatappa and Keshavayya. One can see the use of Gesso work in Mysore paintings. Gesso is the hallmark of all traditional paintings in Karnataka. It was used for depicting intricate designs like cloth, jewellery and for other details. In Karnataka dressing varies from one district to the other. Usually saree is the traditional dress for women. However it is tied in different ways in different districts. Dhoti or Panche (in Kannada) is the traditional dress for men. 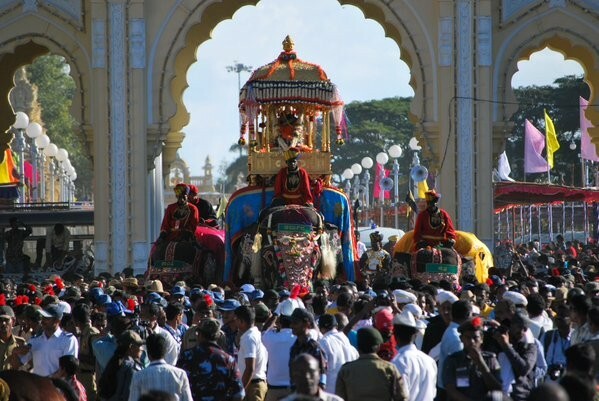 Mysore Dasara festival also known as Nada Habba (state festival) is celebrated with great energy and pomp. It is a 10day festival. Some other important festivals that are celebrated all over Karnataka are Ugadhi (New Year), Ganesh- Gowri Festival, Sankranti (harvest festival) Nagar chauthi and Nagar Panchami (brother-sister festival), Deepavali, Shivaratri, Basava jayanthi etc. Some famous personalities of Karnataka. Karnataka has many great personalities in all fields. Some of them are Basavanna (social reformer), Anil Kumble (cricketer), Aishwarya Rai Bachchan (Actress), Akka Mahadevi (Poet), Purandara Dasa (composer), KM Cariappa (Field Marshall), Dr H Narasimhaiah (Academician), KV Puttappa (Writer), R K Narayan (Writer), Dr Rajkumar (Actor), Sir SM Visvesvarya (one of the greatest Civil Engineer), , Doriswamy Iyengar (Singer), Jagannatha Dasa (composer), Shakuntala Devi (well known as human computer), Adikavi Pampa (poet), Kanaka Dasa (composer) and many more. 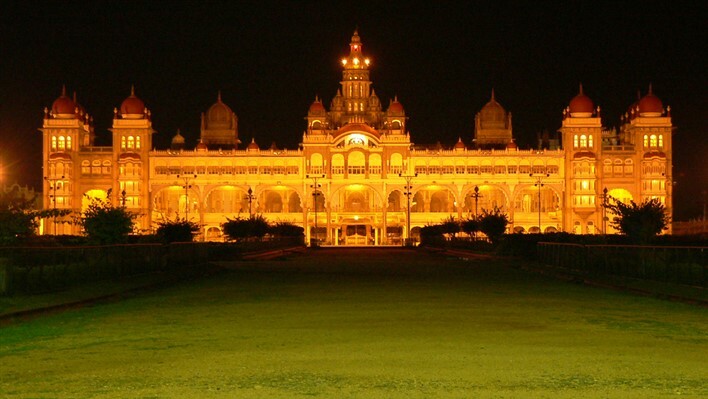 Karnataka is one of the most sought of tourists destinations in India. The state has something for everyone and for every age group. It can be mythological temples, trekking, waterfalls, hill stations for nature lovers and many more. The state has around 500 centrally protected monuments. The costal line is blessed with beautiful beaches. The coastal part of Karnataka has many touristic places like Udupi, Gokarna, Malpe beach, Dharmastala, Karkala, Mudabidri, Kollur, Honnavar, Ankola and Murudeshwar. As you head towards North Karnataka one can feel the change in landscape, the weather and cuisine as well. People in north Karnataka prefer to eat Jawar roti with vegetable and in coastal Karnataka coconut and fish is used extensively. It is pertinent to note that generally local cuisines are based around the locally abundantly available ingredients. North Karnataka includes districts of Belgaum, Bijapur, Gulbarga, Bagalkote, Bidar, Bellary, Gadag, Raichur, Haveri and Koppal districts. Hampi and Pattadkal are world heritage sites. Badami have famous rock cut cave temples. Pattadakal and Aihole is famous for beautiful temples built during Chalukya dynasty. South Karnataka has waterfalls, National parks, palaces etc. Some of the important places in South Karnataka are Bangalore, Mysore, Srirangapatna, Mandya, Belur, Halebidu, Bandipur National park, Nagarhole National park, Talakadu, Jog falls, Hogenikal Falls, Mekedatu and Shivanasamudra. Karnataka has many forts and palaces built during various dynasties. Some of the important forts and palaces are Mysore Palace, Jaganmohan Palace, Bangalore palace, Bijapur fort, Chitradurga fort, Bidar fort, Basavakalyana fort, Belgaum fort, Kittur Rani Chennama fort, Gulbarga fort, Raichur fort and Bellary fort. Some famous hill stations in Karnataka are Madikeri, Agumbe, Kemmangundi, Nandi hills, Talakaveri, Sakaleshpura, Kudremukh, Coorg, Chikmagulur, Biligiriranga Hills, Somwarpet, Savandurga and Yana. The state is also famous for waterfalls, National parks, caves and Dams and reservoirs. All in one it can be said that Karnataka is a wonderful and most beautiful place to visit and enjoy your holidays. Karnataka has many historical places. 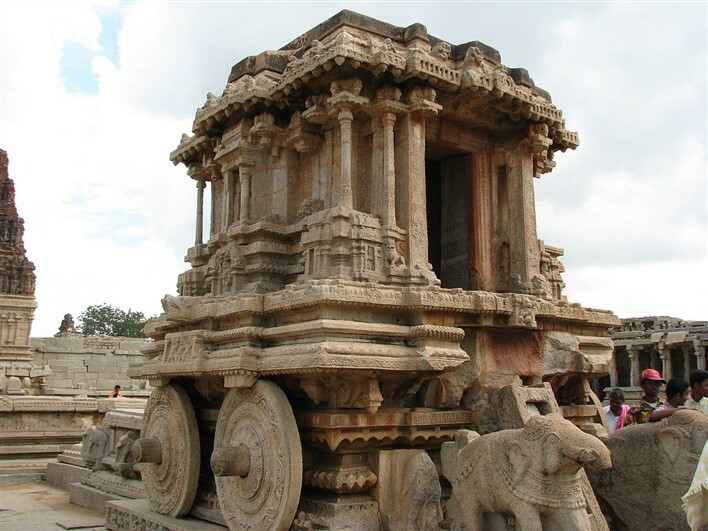 Some of the famous historical places in Karnataka are Badami, Aihole, Pattadkal, Hampi, Belur, Halebidu and Bijapur.